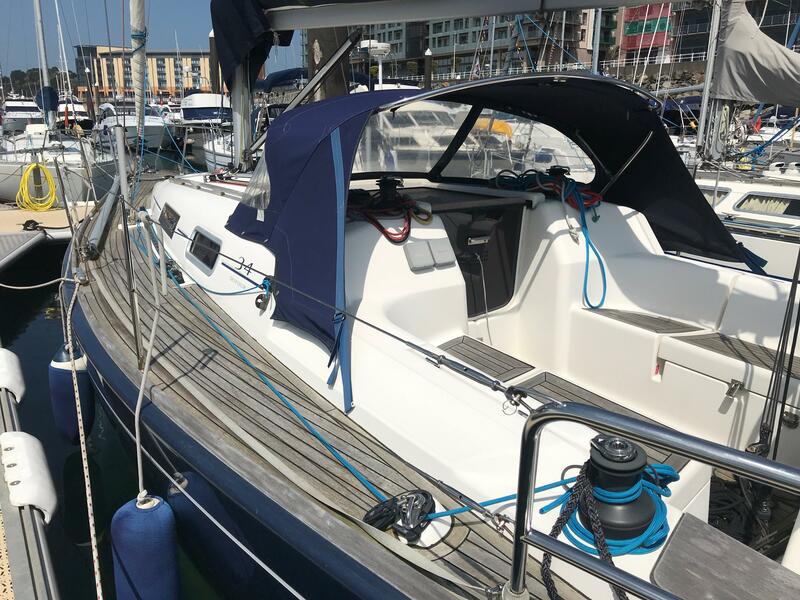 Very well equipped Dufour 34 Performance racer cruiser, well maintained and ready to go. extras include the taller rig and deeper fin keel. 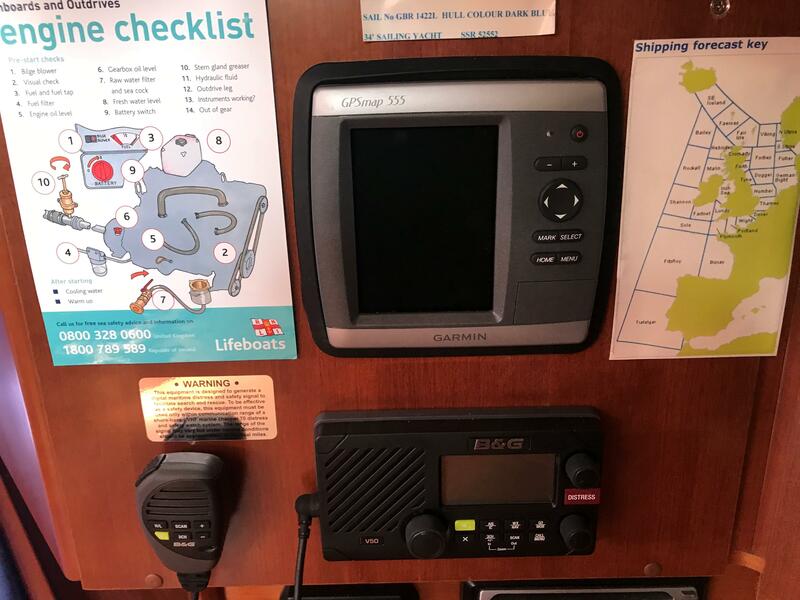 heating, Garmin plotter and much more. 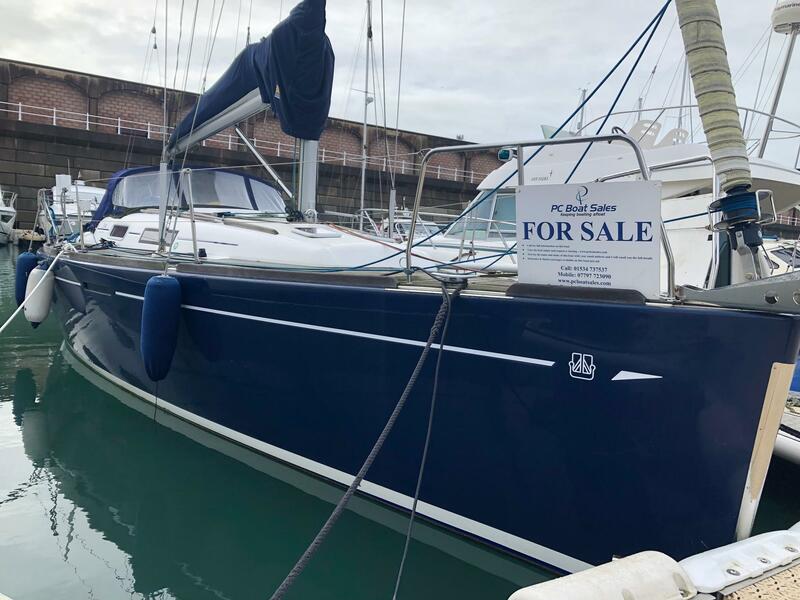 presented well for sale and located in Jersey Channel Islands. 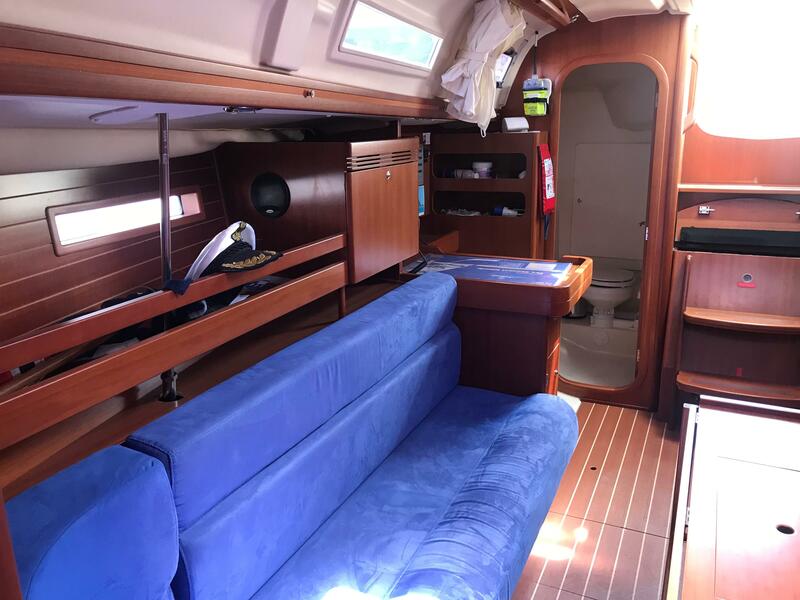 The Dufour 34 meets all criteria that has made the Dufour 40 a worldwide success: speed on all points of sailing, stability and manoeuvrability, good-looking and useful design, a practical interior layout. With the Dufour 34, Dufour has created a new benchmark among 34-foot fast cruisers. 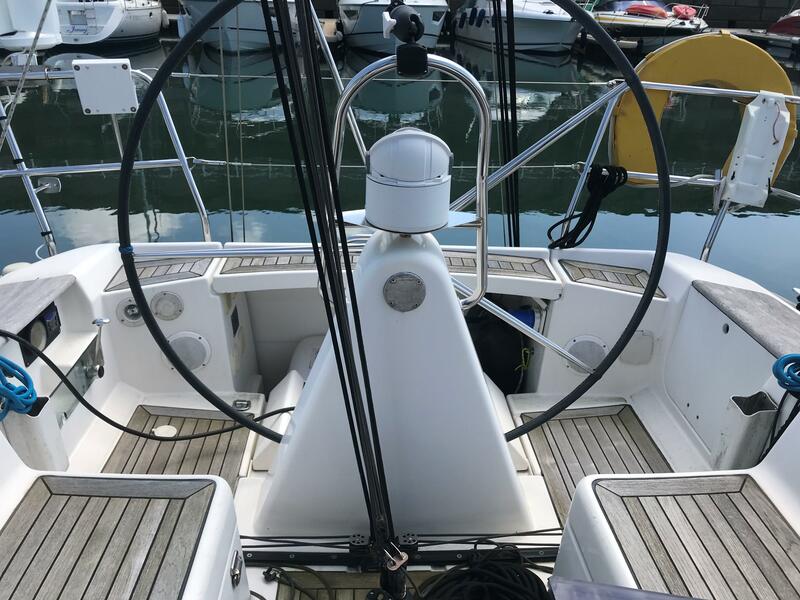 Sailing a Dufour 34 is sheer pleasure: You can either share it with a crew, or enjoy sailing her single handed, as she is very easy to handle. Teak trimmed seats, slightly curved GRP sole. Large side lockers with lids fitted with padlock hasps. Large size steering wheel with pedestal (option). Compass on aft side of coach of coach roof. Single lever engine controls and recessed engine control panel. Oddments tray integrated in engine control panel. 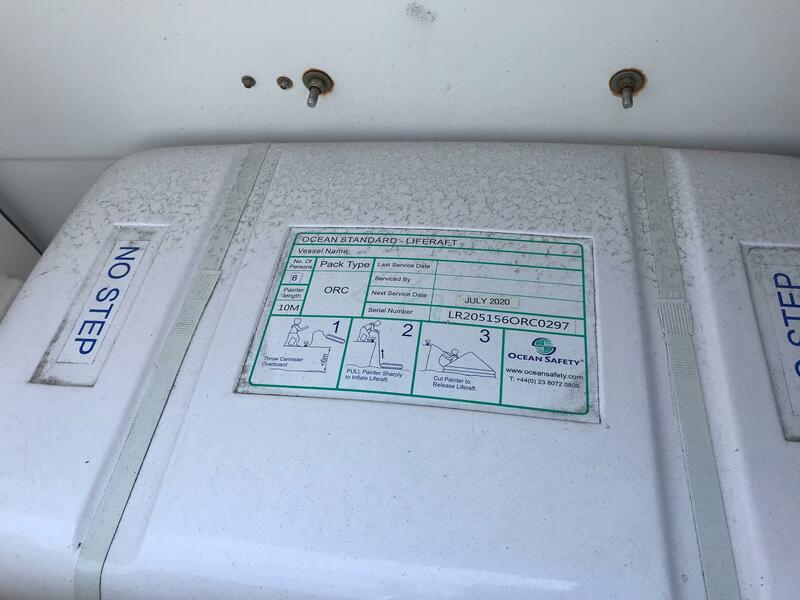 Large Propane locker in aft port seat. 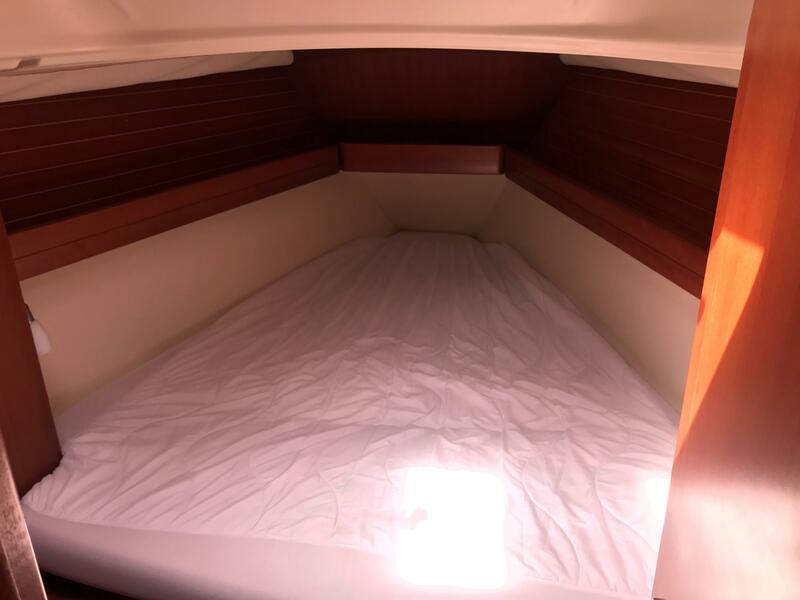 Life raft stowage with straps under helmsman seat. Swim/boarding platform teak trimmed in central part. 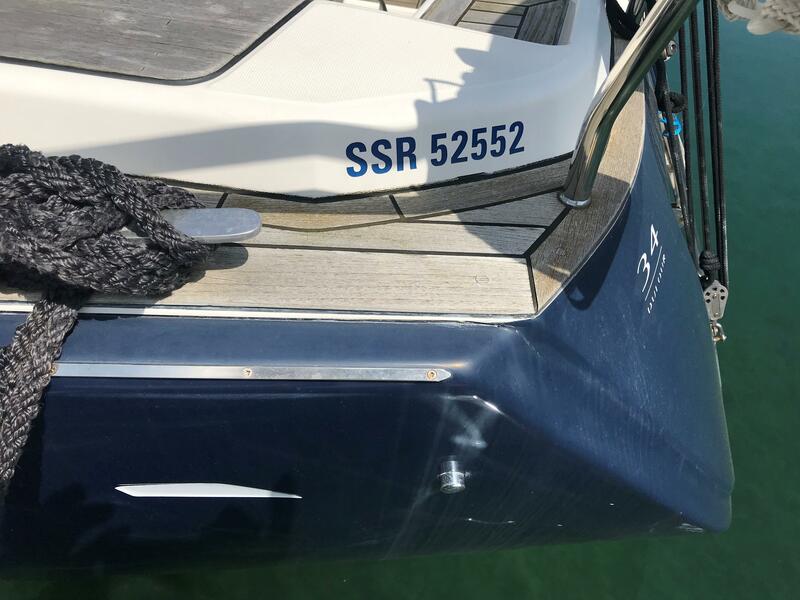 S/S grab rail as well as step on transom. 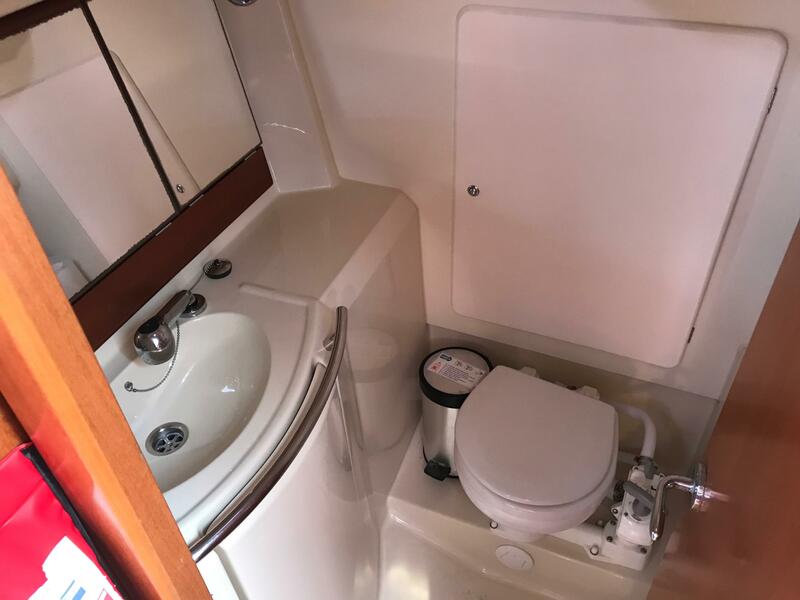 Cockpit shower in aft locker. Stainless steel bathing ladder in the centre to be folded on transom, with teak steps. Teak handrails on coachroof. Wooden toerail on hulldeck joint. Self-draining chain locker with eye bolt and integrated windlass bracket, cover with locking bolt. Stemhead fitting with removable anchor roller. Pulpit in two separate parts with separate green/red navigation lights. Asymmetrical spinnaker tack ring ahead of forestay. Pushpits with horseshoe buoy racket, flag pole holder and opening cable gate with hook. Stanchions with 2 levels of stainless steel guard-rails. 4 Mooring cleats, stainless steel rubbing plates on sheer line. Single chainplate for cap shrouds/aft lower shrouds including an eye for fixing extra control lines. 2 deck filler plates for water, 1 for fuel. Mainsheet track on cockpit sole with adjustable traveller. Genoa sheet track with piston lead blocks. 2 x sheet turning blocks with buil tin jammer and pad-eye for fixing spinnaker sheet block. Aluminium mast step with return blocks. Stainless steel swan neck for electric cable gland. 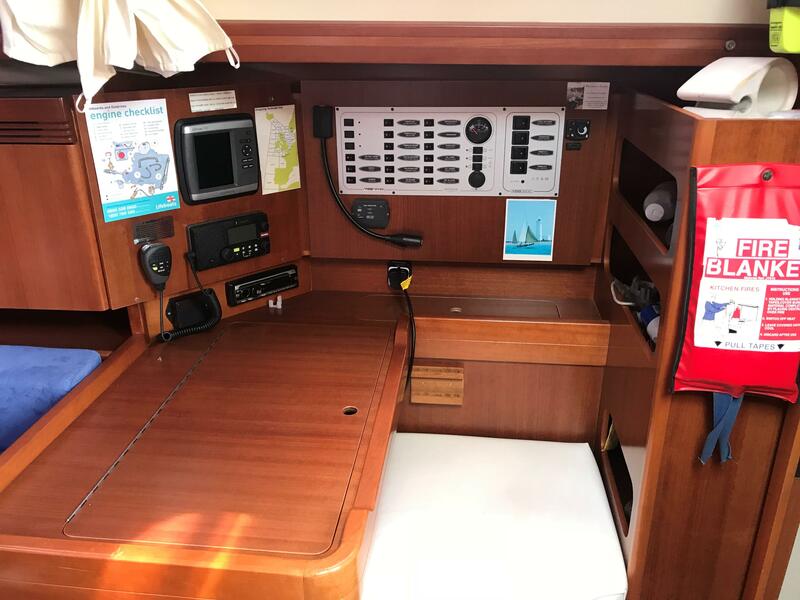 3 and 5 sheave deck organizers for halyard returns to cockpit. 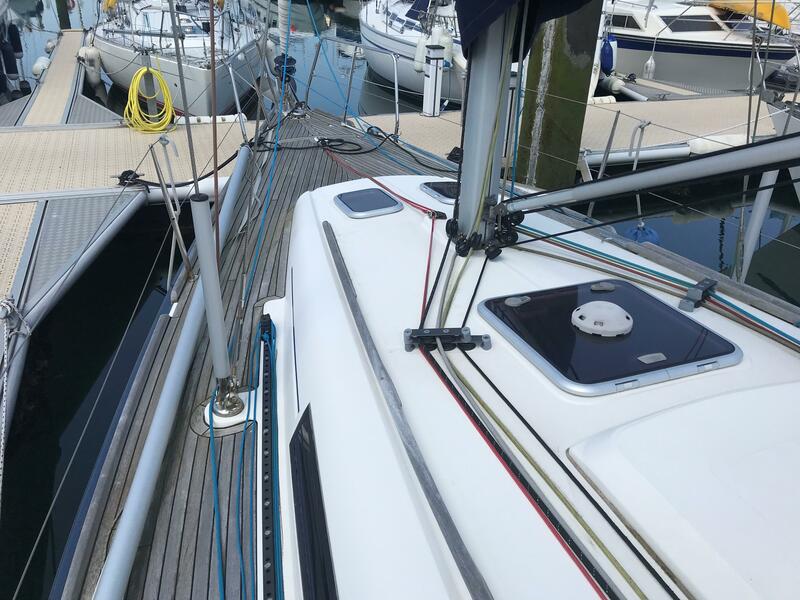 2 x 32.2 ST halyard winches on coachroof. 2 x 40.2 ST Genoa sheet winches on coamings close to helmsman. 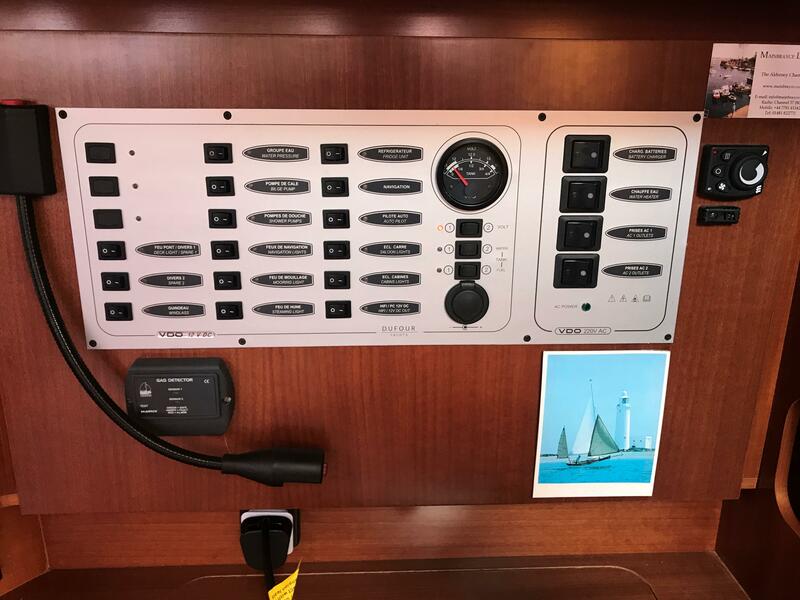 Clutch on toerail for Genoa furling line. 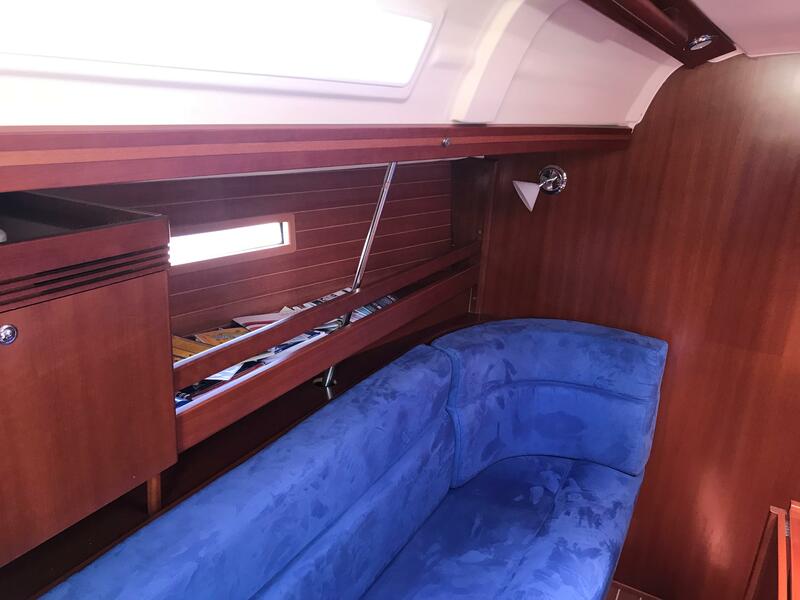 Sliding companionway hatch and washboard in Plexiglas with stops and lock. Stowage of washboard under port side berth. GRP cover ahead of companionway with spray deflector. All joinery work in prime choice light Moabi mahogany, with fiddles and mouldings in solid wood. Locker doors have ventilation louvers. The cabin doors have double anti-vibration bolts. The floorboards are in laminated marine Moabi wood. 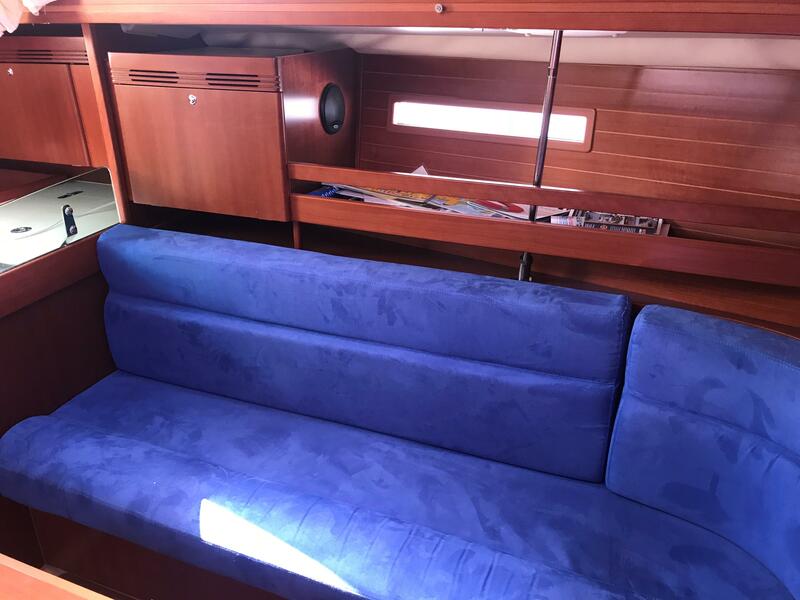 Cabin mattresses and saloon cushions have removable covers. 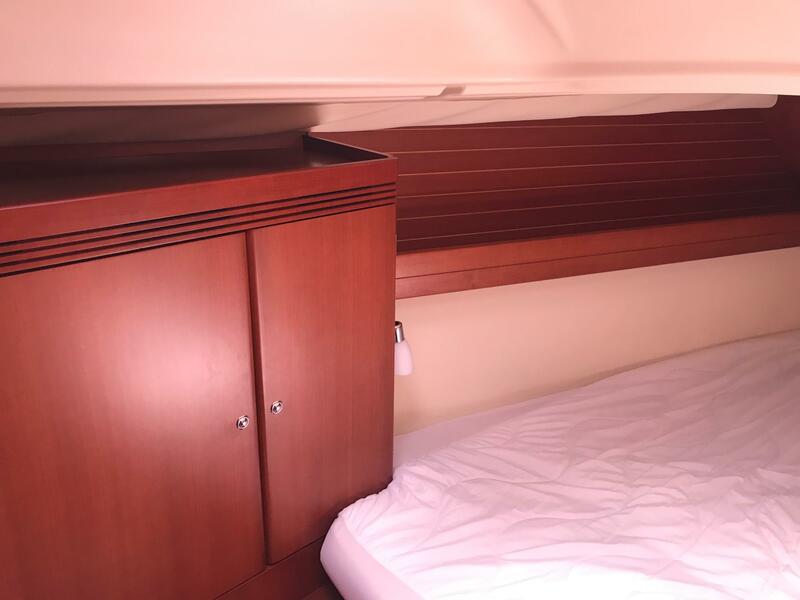 The upper cabin and saloon linings are in Moabi wood. 12 V outlet at galley and switchboard. 1 x 75 Ah house battery. Battery switch for each battery. 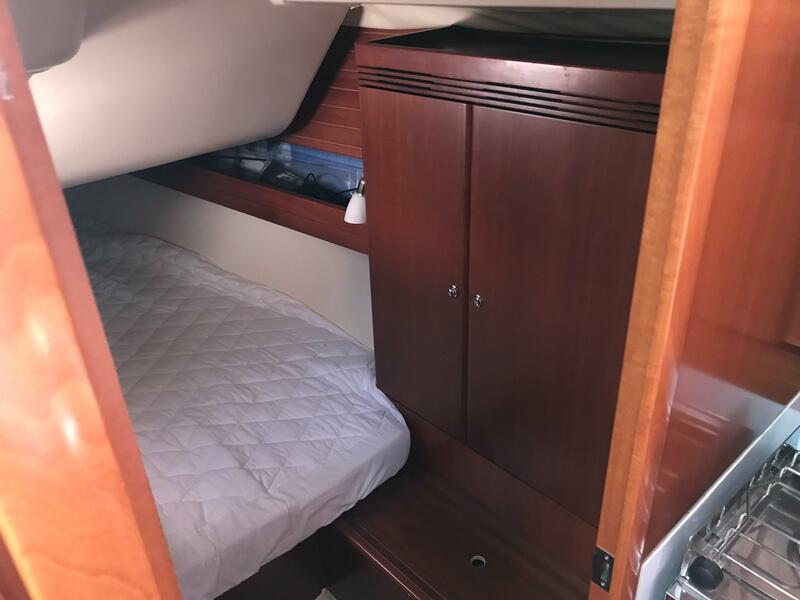 L-shaped galley close to companionway. Chrome plated brass mixer tap for pressurised water (hot/cold). Cooker with 2 burner stove/oven on gimbals. 12 V electric refrigerator with ice cube compartment. Stowage under sink with shelf and sliding baskets. 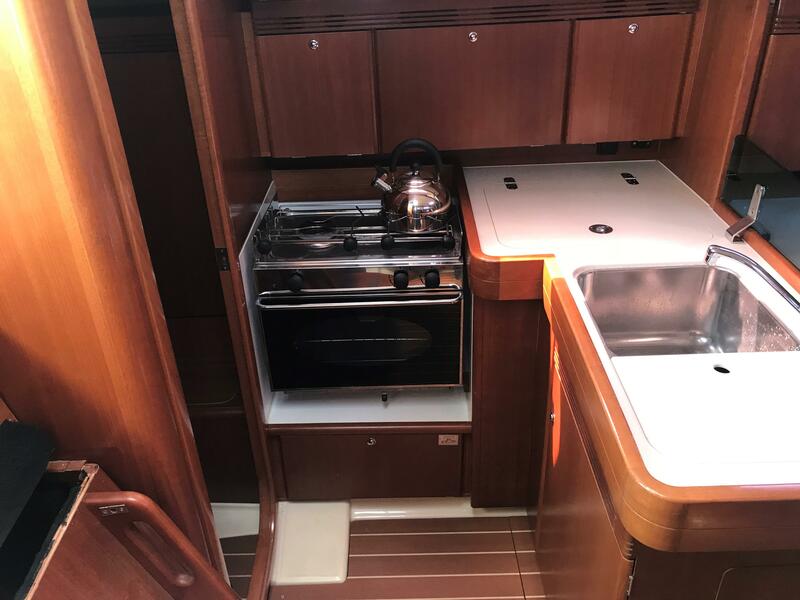 3 upper cabinets with doors on hull side. 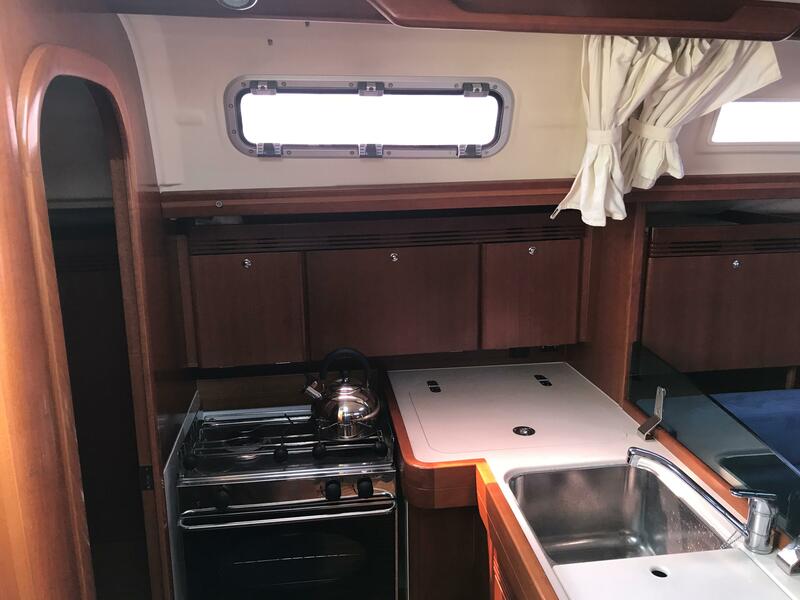 Light and ventilation ensured by opening port-light and 2 spotlights over galley. 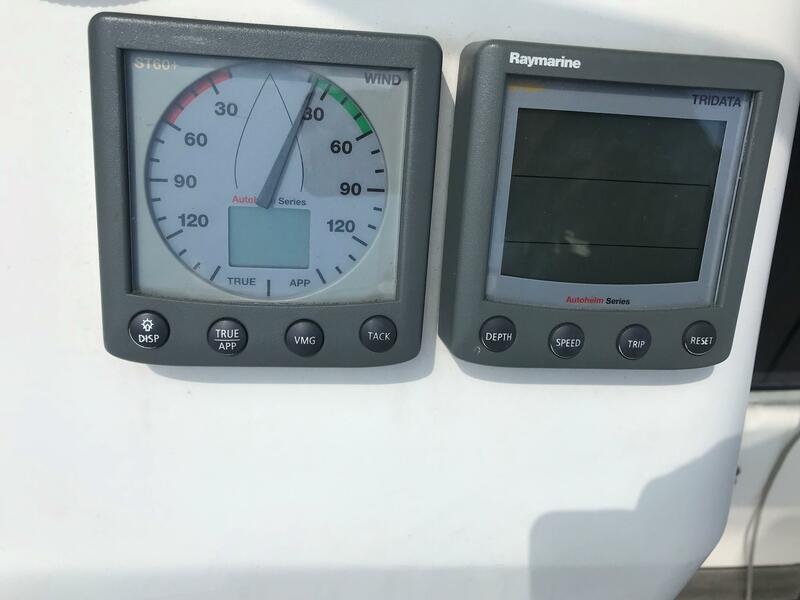 Control panel close to helmsman, with hour meter and tachometer. 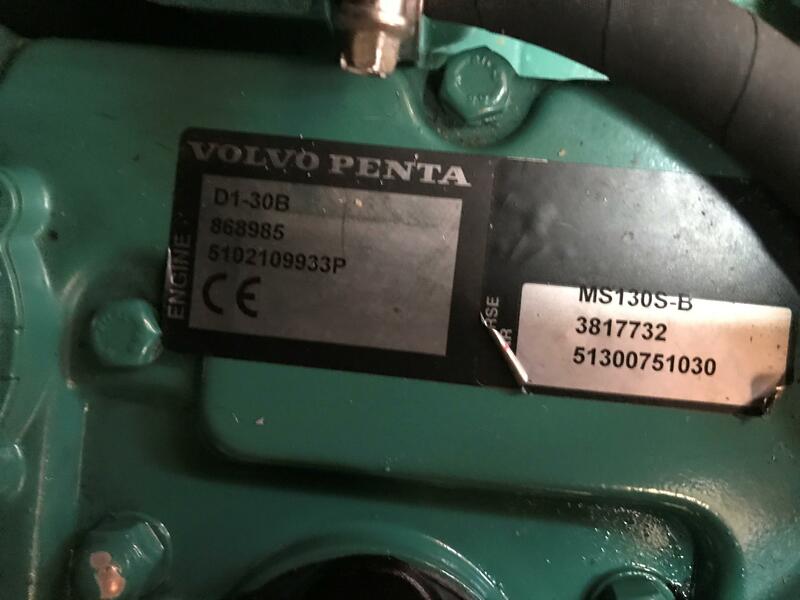 Fuel tank approx. 90 l, gauge on electrical switchboard. Fuel filter with water separator. Engine room ventilation blower, and 2 ventilation hoses. 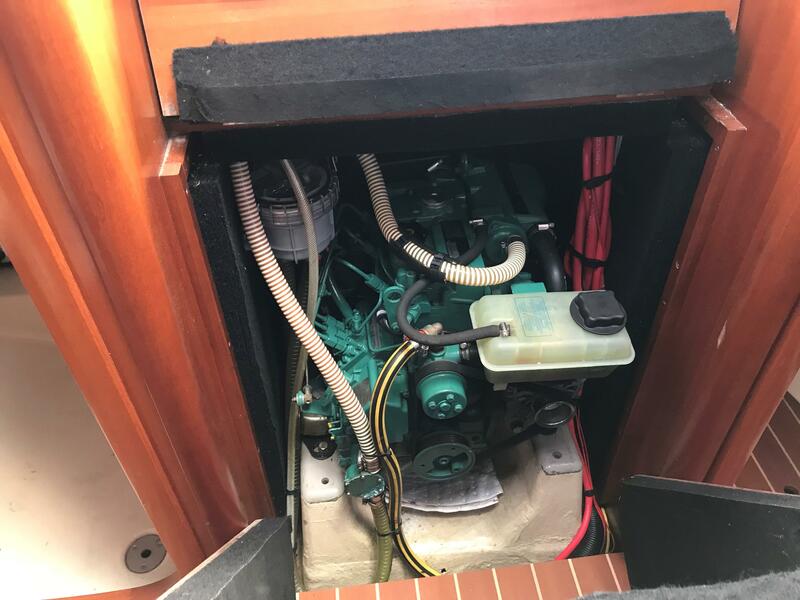 Access to the engine from front and both sides. Quality sound proofing high density foam. 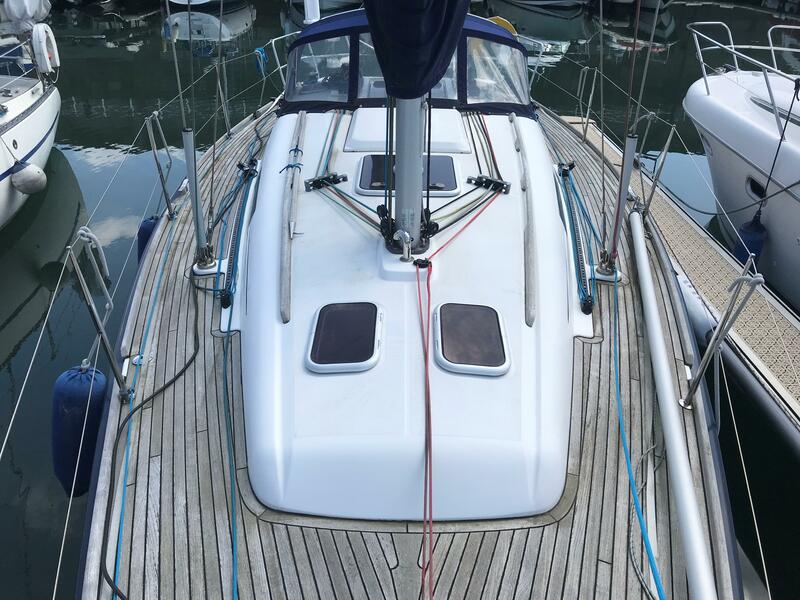 Anodised aluminium mast with double swept backed spreaders, rigged 9/10, deck stepped. 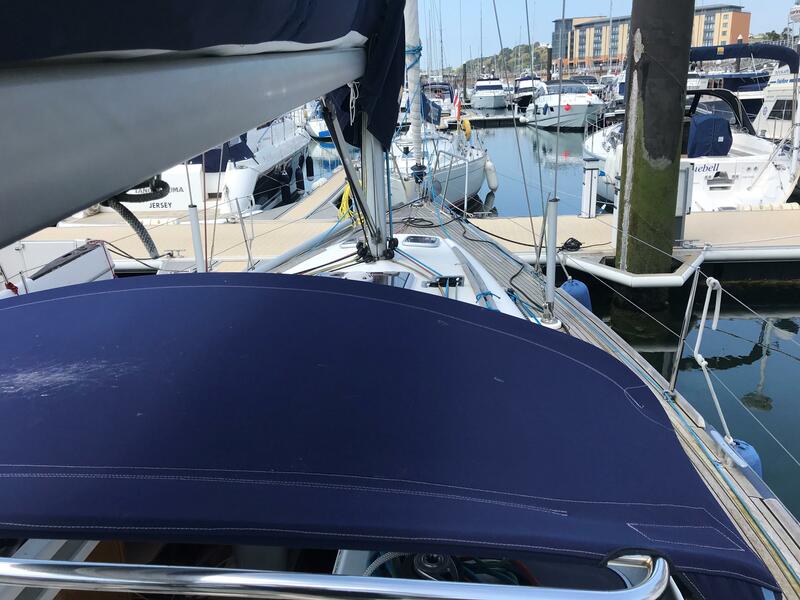 Possibility to rigging a removable inner forestay (optional). 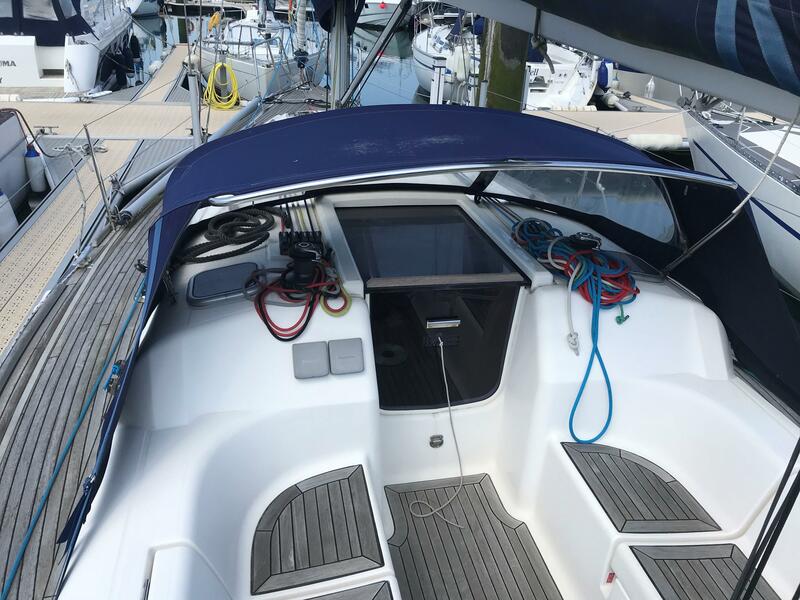 Anodised aluminium boom equipped with single line reefing system. Rigid boom vang, with tackle led back to cockpit. 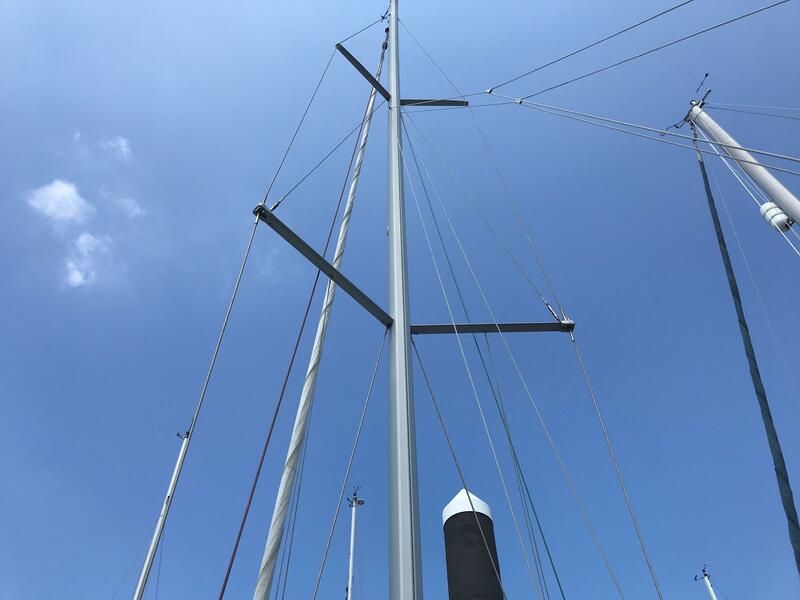 Discontinuous standing rigging in single strand stainless steel Dyform cable and chrome plated bronze turnbuckles including: forestay, backstay, cap shrouds, inter and lower shrouds. 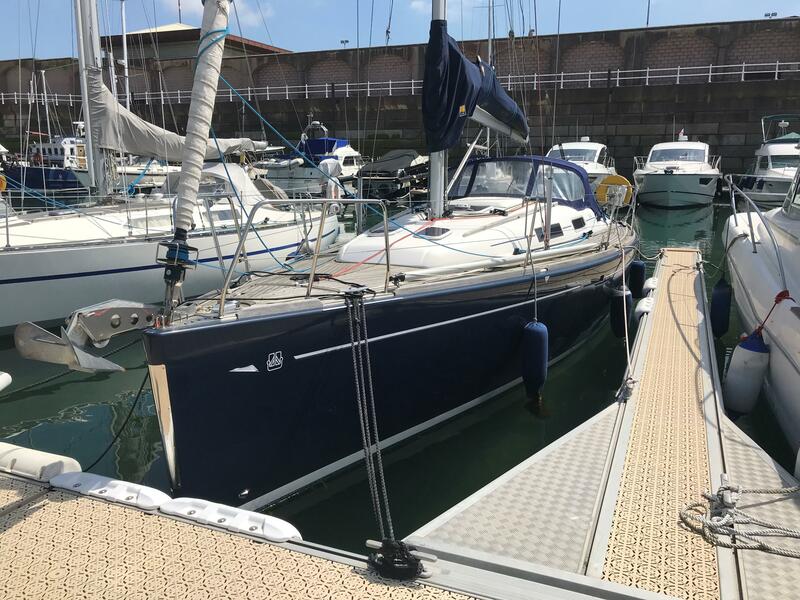 Split backstay with 32 to 1 purchase. Running rigging in pre-stretched textile including: ? low stretch ? 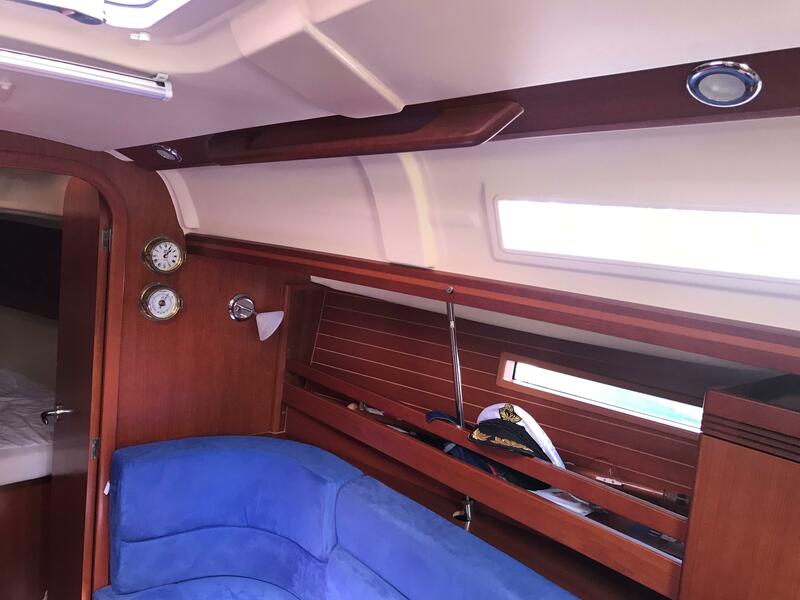 main and Genoa halyards, boom topping lift, main sheet on 5 to 1 purchase and Genoa sheets, reef lines and furling line. Mainsail with logo in high tenacity cloth, with two broad reef bands. 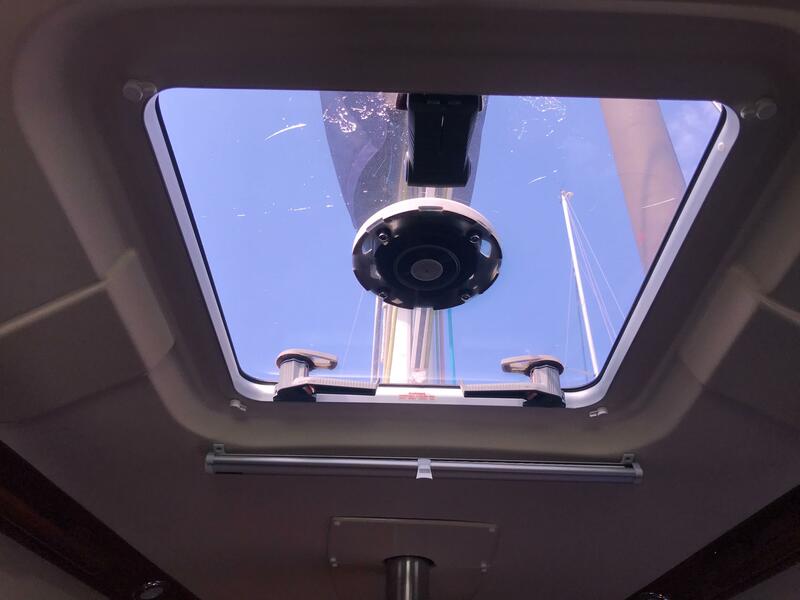 Special bi-radial roller furling Genoa with anti-UV protection. Hand laminated GRP Hull, vacuum bagged. PVC foam core sandwich above water line. NPG Gelcoat with first layer of cloth impregnated with NPG resin forming an optimum barrier against osmosis. Inner moulded hull bottom, structural framing laminated to the hull. Navy blue decorative stripes on hull and coach roof. Provision for ducting (heating or conditioning). 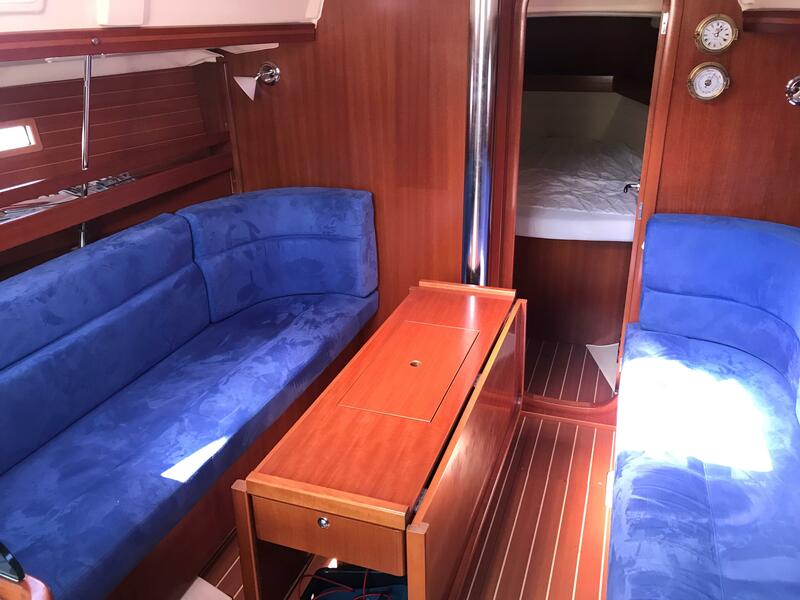 Deck in PVC foam core sandwich, moulded by injection process (Resin Transfer Moulding) for significant weight saving and excellent interior finish. Standard draft 1.50 m, cast iron keel, bolts loads taken up by stainless steel backing plate. Semi-elliptical rudder, filled with closed cell epoxy foam. Stainless steel solid stock, on self-aligning bearings.